Communication between Newsteo radio products and reception center (PC with RF-to-USB key) can sometimes be perturbed by obstacle or too high distance. 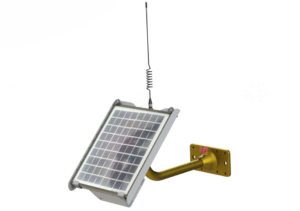 The Newsteo Repeater will be installed mid-way, acting as radio relay for all products out of radio reach. Outside building use: solar powered. The product is self-sufficient, resistant to rain, UV and dust, and therefore perfect for outdoor uses. The installation is very simple: once the products installed and started, the radio communication is automatically configured without user intervention. The radio product, depending on its position, either directly communicate to the PC or through the Repeater. A repeater can double, or even tenfold, the radio range of the loggers, but it causes higher consumption on the loggers used in monitoring (due to latency and transmission times with the receiver). In general and on average, it is recommended to divide by two the autonomy of the loggers (which go through the repeater to transmit). Consequently, when it is possible, it is always better to use a large antenna (full-wave grounded ideally), rather than a repeater in your applications.